Few Americans know much more about Nathan Hale than his famous last words: "I only regret that I have but one life to lose for my country." But who was the real Nathan Hale? M. William Phelps charts the life of this famed patriot and Connecticut's state hero, following Hale's rural childhood, his education at Yale, and his work as a schoolteacher. Even in his brief career, he distinguished himself by offering formal lessons to young women. Like many young Americans, he soon became drawn into the colonies' war for independence, becoming a captain in Washington's army. When the general was in need of a spy, Hale willingly rose to the challenge, bravely sacrificing his life for the sake of American liberty. Using Hale's own journals and letters as well as testimonies from his friends and contemporaries, Phelps depicts the Revolution as it was seen from the ground. From the confrontation in Boston to the battle for New York City, listeners experience what life was like for an ordinary soldier in the struggling Continental army. 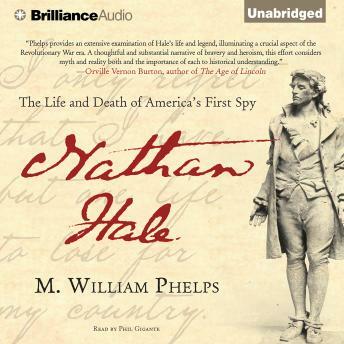 In this impressive, well-researched biography, Phelps separates historical fact from long-standing myth to reveal the life of Nathan Hale, a young man who deserves to be remembered as an original American patriot.